Carrying a gun is a serious choice. Take a serious class from a serious instructor...who doesn't take himself too seriously. My carry class is for real. You'll find shorter classes, and cheaper classes, but you'll look hard to find a better one. This is a typical schedule. The class consists of about five to six hours in the classroom, followed by a trip to the range for a brief shooting qualification exercise. "Andrew knew his stuff, and taught a very good class. He teaches with a fun attitude, and seems to really enjoy teaching the permit to carry class. Thanks, Andrew." The time does vary a bit from class to class, depending on the number of students, the depth of class questions and discussions, and the capacity at the range. Did you know that stress and adrenaline will change your grip, stance and point of aim? Photo © 2013 Mark Bitner. All rights reserved. Used with permission. The Minnesota Permit to Carry a Pistol class will allow you to apply for a Minnesota Permit to Carry (as well as permits from several other states). Assuming you are not disqualified for being a felon, gang member, illegal alien or drug addict, you will be issued a permit within a month of submitting the application. 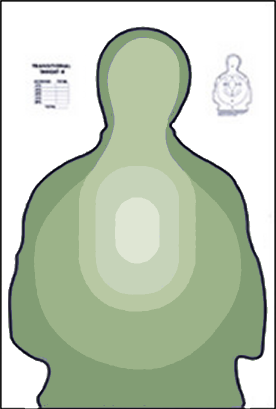 The qualification target. The inner two ovals are "perfect" shots. The whole target is a little over two feet wide and three feet high. If you already know how to safely handle, load, shoot and unload a revolver or semi-auto pistol, you shouldn't have any problem passing the qualification. 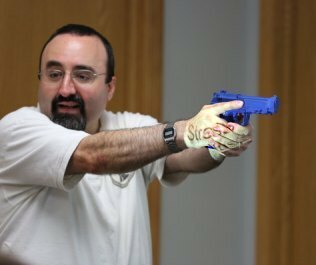 Most people who have at least some experience shooting a pistol pass the test on the first try (and of course, my beginner-to-carry class and beginner pistol class students get a lot of good experience in class. It also turns out that most rifle or shotgun shooters have no problem adapting their skills and experience to a pistol with just a few minutes of instruction and practice. If you're not sure, or just have a question, please feel free to contact me. If for some reason you're not ready, or you're having a bad day, don't worry. If it's a small issue, I'll help you fix it. If you really don't have the skill yet, I'll recommend that you get some practice or instruction, as needed, and come to my next class to retake the qualification. I don't charge extra, of course, if you need to retake the test. My goal is the same as yours: to ensure that you are a safe and educated shooter.